The Parker Solar Probe broke two records on October 29, becoming the fastest object ever built, and coming closer to the Sun than any previous spacecraft. Both records will continue to be shattered on a regular basis as the historic mission progresses. Closing within 42.73 million kilometers (26.55 million miles) from the Sun, Parker broke the previous record for closest approach to the Sun, set by the Helios 2 spacecraft in 1976. At its closest approach in 2024, the Parker probe will approach within 6.16 million km (3.83 million miles) of our companion star. The vehicle also passed another record set by Helios 2, surpassing a velocity of 246,960 kilometers per hour (153,454 MPH), relative to the Sun. “It’s been just 78 days since Parker Solar Probe launched, and we’ve now come closer to our star than any other spacecraft in history. It’s a proud moment for the team, though we remain focused on our first solar encounter, which begins on Oct. 31,” said Andy Driesman, project manager on the mission. The spacecraft communicates with mission controllers on the ground via the Deep Space Network (DSN). By sending a signal to Parker, and analyzing the information which is returned, engineers at the Goddard Space Flight Center determine the distance the spacecraft is from the Sun, as well as its velocity. At its greatest velocity, the Parker probe will be orbiting the Sun at over 692,000 KPH (430,000 MPH). At that speed, the spacecraft could travel the distance between Washington, D.C, and Philadelphia in just one second. Seven times during its journey, the vehicle will fly by Venus, using the gravity of the planet to slow down the spacecraft. Usually, gravity assists like this one are utilized to add velocity to spacecraft. The Parker probe is equipped with a heat shield which will sustain a temperature of nearly 1,400 degrees Celsius (2,500 F) — hot enough to melt many types of iron, while keeping the electronics inside the vehicle at room temperature. 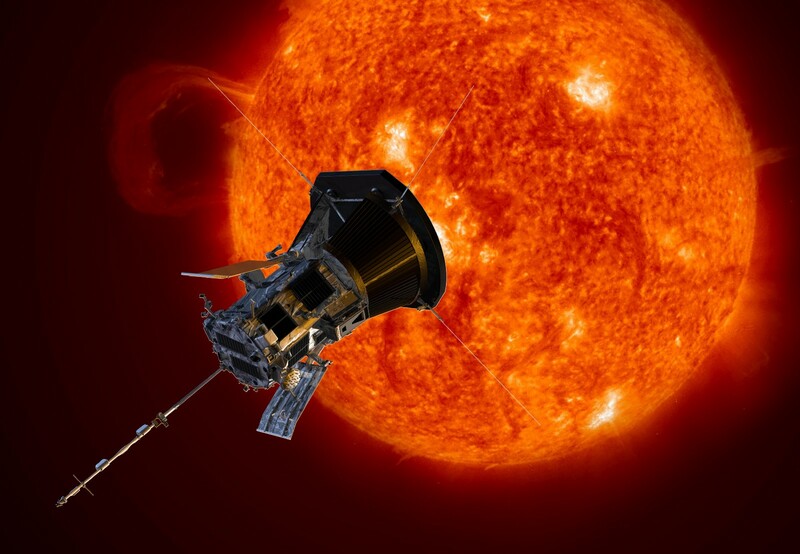 The Parker Solar Probe was launched on its journey toward the Sun on August 12. 2018. One of the primary objectives of the mission is to explore the corona, or atmosphere, of the Sun. It is in this layer where solar storms can develop, capable of crippling all electronics — or possibly even most life — on Earth.